Likud denies Israel Hayom report claiming Likud threatened that if AG decides to try Netanyahu 'he'll be attacked mercilessly'. 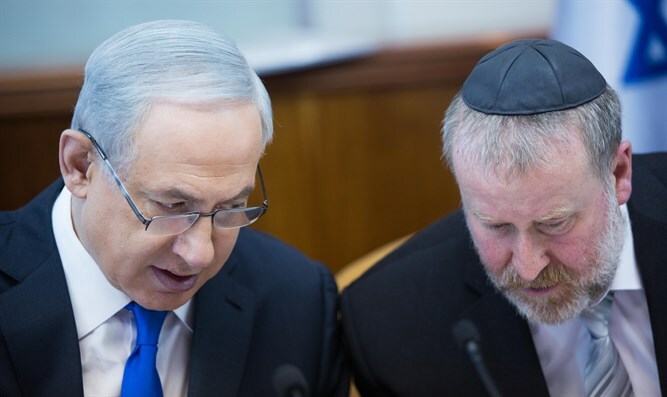 Likud party officials this morning deny an Israel Hayom report the Likud is threatening that if Attorney General Avichai Mandelblit publishes his decision regarding indicting the Prime Minister before the elections, he will be "attacked mercilessly". An official statement issued by the party said, "The claim that Prime Minister Netanyahu said this is incorrect, because Prime Minister Netanyahu did not talk to anyone about this. "No one in the Likud is threatening the Attorney General. Threats and pressures to indict Netanyahu at any cost and in any case - come daily from the Left and the media," the statement said. According to the report, the Prime Minister told his associates that even if a final indictment is filed against him, after a hearing, he is not going anywhere. In the conversation it was further clarified that if and when there is a trial, it will be conducted when Netanyahu serves as Prime Minister, if he wins the election.